In my previous blog I promised exploration of Big Data on SAP HANA, express edition. But remember, the Big Data is not only about the Volume, but about Variety (of data types) as well. And this is the route I chose first to look at the fun stuff you can do with spatial data processing in SAP HANA. Ever since I enjoyed “Calculating Pi with Darts” video from Physics Girl and Veritasium [which you should watch too!] I have thought about repeating it. The world is going digital, so obviously I meant using SAP HANA for that. I know I should have done it during the PI Day (3/14/16, or on the 14th of March 2016), but better later than never! 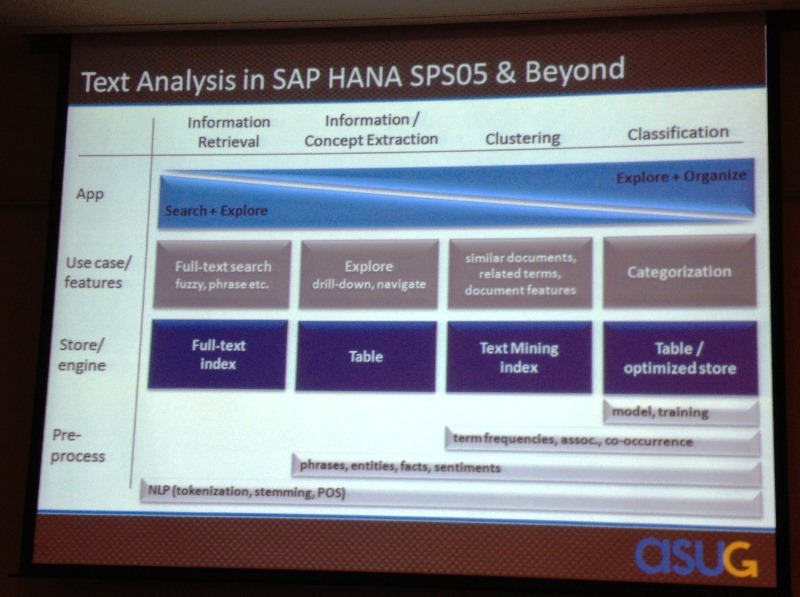 Looked like SAP HANA’s spatial capabilities would fit perfectly for that. If you are not familiar with spatial processing I prepared four introductory tutorials that should not take more than 20 minutes for your to complete and understand all basic concepts needed to follow the rest of the blog. 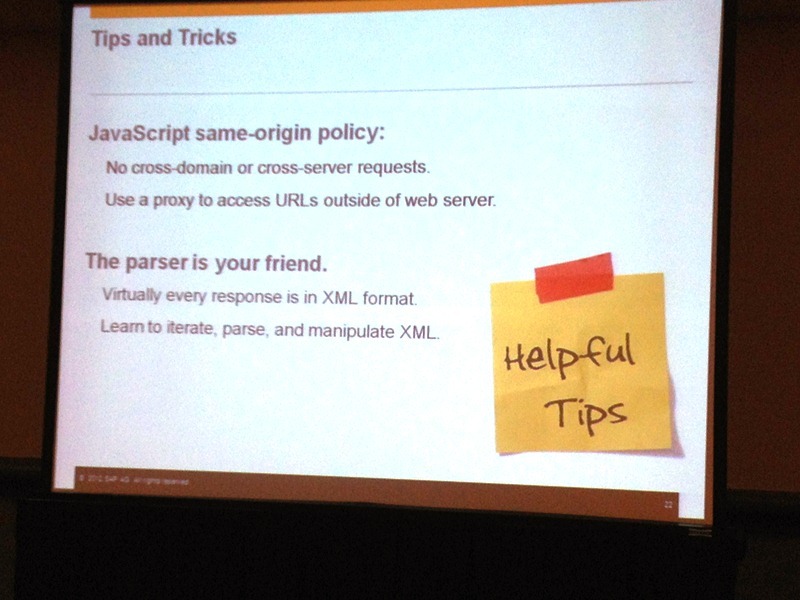 And if you do not have SAP HANA Express yet, then it is 10 minutes to get it. Alternatively you can use as well SAP HANA MDC instance in your HCP Trial account as we are still not talking about huge volumes of data here. Virtual dart hits are points with random X and Y coordinates (objects ST_Point). The dartboard is a disk (ST_Buffer() around a ring’s center point). 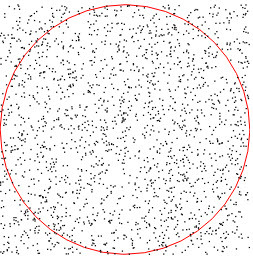 And then calculation of the average of hits within an area of the disk (ST_Within() method). First I need a table with a spatial column, which will store coordinates of my digital hits, plus a procedure to populate this table with required number of attempts. Now let’s check the result of throwing 2000 virtual darts and what the PI number approximation will be! Let’s visualize the results by generating SVG with a dartboard and all generated hits. I did a minor modification of the SVG to have a circle in red. Then I tried 50000 attempts, but the result was 3.1168. So, no much improvement over previous attempts. Please let me know what pi numbers you got by throwing digital darts in your SAP HANA instances. I just returned from Kraków, where I had a pleasure to attend Mobile Mobile Conference. Well well done. 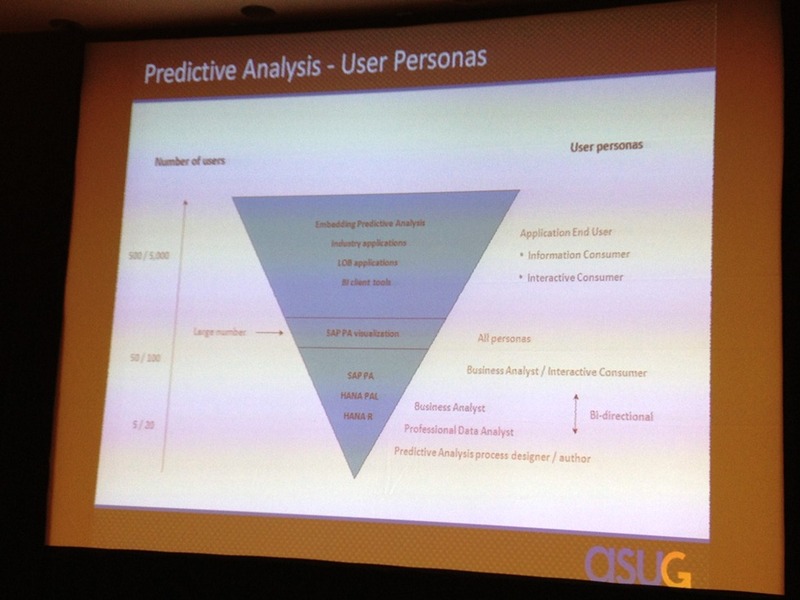 What did analytics guy focused mostly on Big Data and Fast Data (and Deep Data and Long Data and You-name-it Data) do at the melting pot of mobile developers and designers from around the world? Well, I’ve been following what’s going on in the mobile world for quite some time. The development of mobile technologies drives requirements for real-time data management, like this delivered by SAP HANA. Interestingly enough recently one student shared with me that his professor had stated “There is no business application with sub-seconds response requirements”. 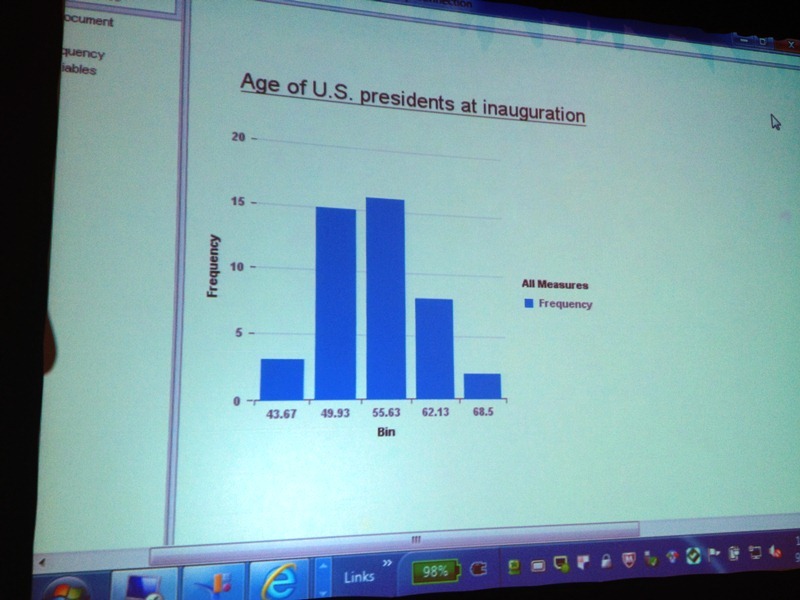 Seems this professor has not used any mobile device. Otherwise he would know that mobile apps reduced expectations for response times to a few seconds. It is not your granpa1’s desktop PC anymore that you leave at the desk to process a report while you’re enjoying infamous “cup of coffee”. Small comment is that most of speakers were from the US, and not all cultural and market references were applicable to Europe. I hardly know any developer in Eastern Europe coding over a coffee in Starbucks… On the other hand, it was a unique chance for European developers to understand American way by listening and talking to presenters. And without need to spend $2000 for a trip over Atlantic. To discuss the merit side of the conference and not to mention the organization side of the event is like to say the half of story in this case. Although it was the first edition of the conference this “small event” (as described at the conference’s webpage) gathered more than 180 participants from 16 countries. Not bad at all for the first time! The secret sauce of this success was the team from Applicake. Guys reapplied same principles as at their already flagship Railsberry event. And if I can share the secret it was the treat of participant in every aspect: accompany informative (yet comfortably short!) sessions with long-enough breaks (for networking), nerdy location (Museum of Municipal Engineering in this case), yummy food (and not forgetting vegans), chilling zone (with comfy seating), fun activities (enriched with Spotify on site), insane gadgets (nerds underwear, anyone?). Have I missed anything on this list? Yup… Sunny weather. Well well done, Mobile Mobile conference! 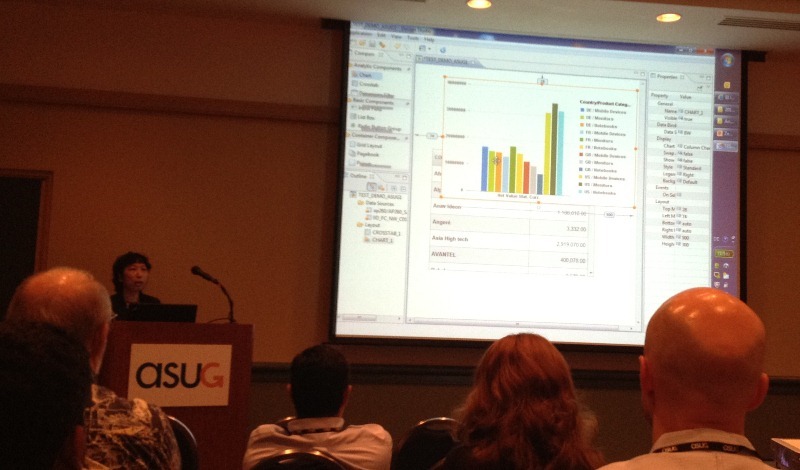 The second day of ASUG SAP BusinessObjects User Conference (SBOUC) in Florida, USA came to the end. Two more days ahead. I am trying to get full advantage of what’s most important on such events: education and networking. It’s ok to “network” on LinkedIn, Xing, SCN or whatever “platform” you are using, but still nothing replaces face to face discussions. When it comes to education, the face-to-face approach is preferable too, but online and offline possibilities are rich as well. If you are attending SBOUC this year, I obviously would love to see you tomorrow (Wednesday) at 1:30pm EST in N. Hemisphere A4 “Impact of In-Memory Technology and SAP HANA on Your Business, IT, and Career“. But even if you have something else already scheduled, or you are not in Orlando this week, ASUG did fantastic job this year again to have all session materials available online. 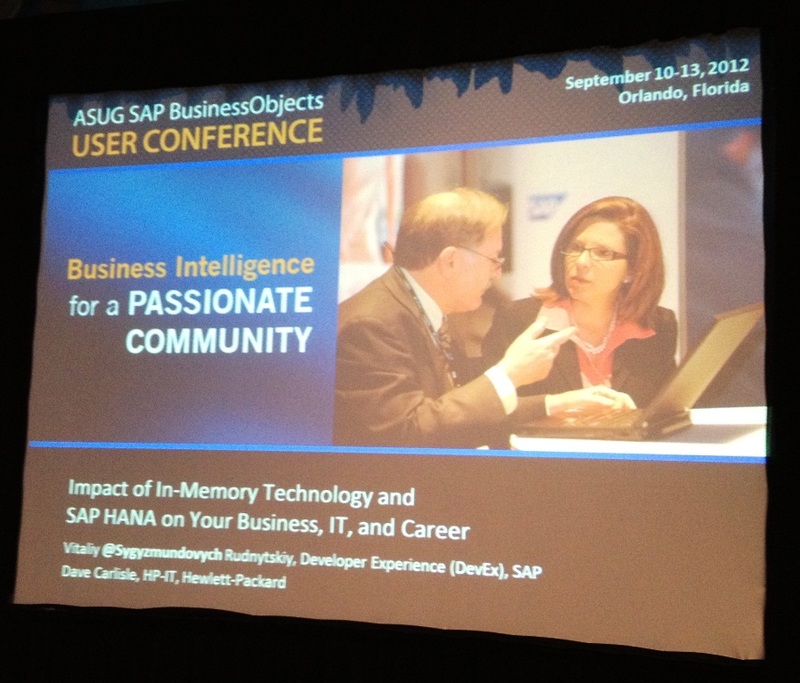 You do not need to be conference participant, or even ASUG member to access and download materials. Enjoy! You will find the whole palette of sessions: from traditional (like BI strategy, Dashboards and Universe Migrations) to new and trending (like using BI4 with HANA, Sybase IQ, Hadoop Hive, or Advanced Data Visualization and Predictive Analytics). Lots to learn? That’s just a beginning, because to get a bit more structure into what you are learning, you can not go to “Learn BI” collection at http://www.sap.com/LearnBI to check official products tutorials for BusinessObjects BI 4.x, but as well for new products like SAP Visual Intelligence. The good news is that besides reading Visual Intelligence tutorial, you can as well get 90-days trial from http://www.sap.com/tryvisualintelligence. Even more – you can join “Data Geek competition” and use data sets already prepared for you by SAP, or to connect to cloud-hosted SAP HANA instance: http://www.sap.com/datageek. Try it! The war is over. I am looking forward to the next year. 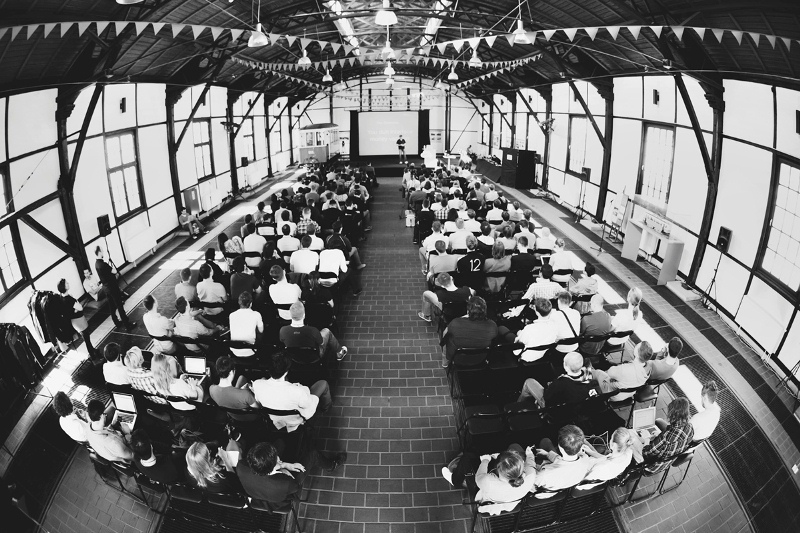 Why did I miss to mention conference keynotes in my post? Luckily I do not need to redo, what has been perfectly done already by Timo Elliott on his blog here. You can find live stream of fresh news from the conference on my Twitter: twitter.com/Sygyzmundovych, or you can search for #SBOUC hash tag. There are moments in everyone’s life when you feel like it’s time for a change. Same happened to me. Ok, ok, may be not as dramatic, as it was for Douglas Quaid in Total Recall. So, in July this year I joined Technology Innovation & Developer Experience (DevEx) team at SAP. I remained located in Wrocław, Poland. Why? There are many great teams doing interesting things in SAP, and I was in talks with quite few of them. But DevEx gave me what I had been looking for: getting back to technology, coding, developers, try/fail/learn etc – all the good stuff that drove me when I first saw a computer (in a book ;-)) and wrote my first BASIC code (on a paper :-D) back in 1986. Events like InnoJam, DemoJam and more. Subjectively Wrocław is beautiful and one of the best cities to live, work and create; it reminds me San Francisco in many aspects. Wrocław was the host of FIBA EuroBasket 2009, UEFA Euro 2012 and will host 2014 FIVB Men’s Volleyball World Championship. The city has been selected as a European Capital of Culture for 2016. In 2017, Wrocław will host the World Games, a competition in 37 non-olympic sport disciplines. Last, but not least: I wanted to stop travelling, and start spending more time with my family. That’s probably the reason why I am writing this post from Frankfurt airport while waiting for my plane to Orlando to bring me to ASUG SAP BusinessObjects User Conference. Therefore SBOUC will be the topic of my next post and my tweets during next few days. Finally it is my first week at home since mid May, and so it’s time to catch up on more news from the last days of the conferences. Hopefully you find below information interesting and relevant besides delay with making it published. The thing that blew me out of my socks during the whole conference was a meeting with a group of start-ups, which are building their products using SAP HANA technology. This was the best show of taking the technology seriously. These guys are not big SIs or customers, who can make a wrong decision, fail, do finger-pointing, and then move on. For start-ups each decision is to live or die, and their founders are betting on the SAP HANA with their very own pocket-money. If you are interested to know more about innovative ideas coming from start-ups, or if you have your own idea and would like to know how to start working with SAP, have a look at “SAP Startup Focus Program“. It is real. I was contacted already by an Ukrainian entrepreneur with his own idea of a product using in-memory technology, and I was happy to refer him to this program. The last day of the SAPPHIRE NOW was the “HANA day”. The whole keynote was focused on HANA, but it seemed to be built around the war with Oracle. 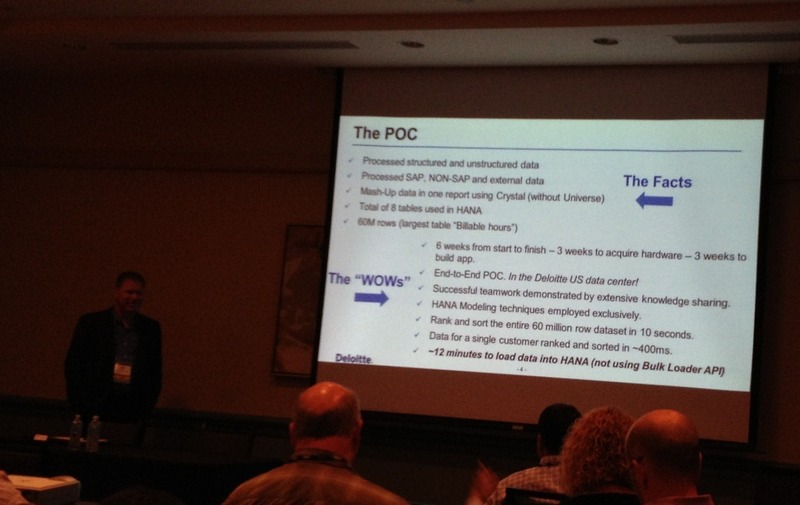 The presentation of 100TB (of RAM) HANA system, which SAP assembled in their US data center, and the demonstration of fail-over capabilities were the answer to FUDs, which Oracle tried to disseminate earlier around SAP’s achievements in in-memory databases’ space. No doubt the most exciting announcement for techies was the availability of free SAP HANA developers licenses!! It was a great achievement of collaboration between SAP and community influencers. You can go to SAP HANA Developers Center and get your HANA database development instance running in the public cloud few minutes later. Just to be clear: “free” is applied to SAP’s license, but not to the hosting cost. Make sure you read the post “Get your own SAP HANA DB server on Amazon Web Services” by Juergen Schmerder of SAP. Juergen is one of the heroes behind making SAP HANA available for the developers community. 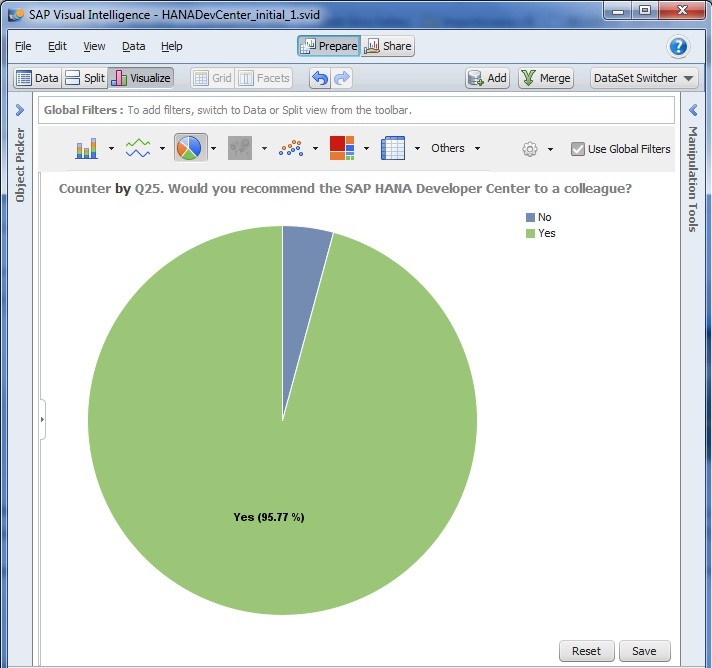 SAP HANA Developers Center delivers a lot of materials to study already, but one more source is worth mention. At the same time the book “SAP HANA Essentials” by Jeff Word became available. If you are interested to get this e-book for free, go to its registration web page and use a Voucher-Code 17C55987 to download. “Analyzing SAP HANA’s Performance Test — SAP Changes the Total Value of Data Warehousing and Business Analytics” by Enterprise Applications Consulting. “SAP and HP Breaking Analytic Performance Barriers with SAP HANA and HP AppSystems” by Enterprise Management Associates. I think information so far is wide and deep enough to take some time to read, digest and analyse. So, let me leave another interesting piece of information – new SAP BusinessObjects BI tool called Visual Analyzer – for a later blog. This week I am attending SAPPHIRE NOW and ASUG Annual two-in-one conference. There are many interesting developments going on in SAP in the areas of cloud, platforms, mobility, but my focus is broad BI/EIM/DM and this is what I am after at the conference. Co-location of SAP’s premier business conference and SAP users’ largest event gives a interesting – and sometimes polarized – view on the state of the business: you see cool HANA-powered mobile-steered 3-D demos on the show floor and you listen to the real customers’ far-from-perfect stories. It’s been just two week since the end of my first SAP BusinessObjects BI 4.0 implementation project (my day life is a technology consultant), and the everyday life stories are closer to my heart than bright roadmaps. My first experience with SBO BI 4.0 was polarized as well. On one hand the breadth of tools portfolio and user’s UI are way better than what SAP/BW could offer with its BEx applications. On the other hand, from the administration point I would expect much more from BI Platform’s CMC, as a single tool for administration, monitoring, and trouble-shooting. Yet all of these are a subject for a separate post. The point here is: with the realise 4.0 of SBO BI, I can easily say that it’s now at the stage where BW customers can and should start looking at the adoption of BusinessObjects BI tools as the front-end for BW data warehouse. Not completely there yet, but certainly incomparably better where it was three years ago. I ran into some discussions with fellow SAP Mentors over that statement. As I was complaining that we waited long 4 years for good BW/BO integration, my dear colleagues with pure BusinessObjects background, like Mico Yuk here, were complaining that SAP almost completely forgot about them and about innovations for the non-BW customers. What is your opinion? The first ASUG education session I attended was by Jeff Duly on the topic of SBO Explorer, accelerated implementation by their BW shop. Besides few minor issues, the business response was overwhelmingly positive, just to confirm the statement that SAP’s decision to acquire mature BI tool set in 2007 was the right one (see also remarks above about the need to continue the integration and unification work). Realistic speed depends on complexity. In reality the performance of the query processing depends on many factors, major of which – when I/O bottleneck is eliminated – is the complexity of tables’ joins. UI rendering time. SAP HANA database dramatically improves performance in data retrieval, but it is still only one of few steps on the way between user’s request click and the final display. Accordingly to presenters, the times to transfer data from HANA to the end-user machine and then get it displayed could go up to 20 seconds – leaving the impression of “long processing” even when the query processing in HANA had taken only 2-3 seconds. Realistic time frame. They kicked off the project in May of 2011 with the plan of go-live in September 2011. But the acceleration of the data processing does not translate into the acceleration of project phases (although no doubt mean less frustration for everyone ;-), and the project went live 4 months later than expected. The customer implemented the project with engagement of SAP Consulting and as I look around it is the case for almost every HANA implementation right now. If you are not a consulting arm in the one of the hardware vendors (HP, Hitachi, IBM etc) and if you are not one of the IT advisory companies (Deloitte, CapGemini etc) already working with the customer on the broad scale – it is difficult to get on the HANA implementation projects. It may be a cold shower for many smaller System Integrators (SIs). As HANA fewer spreads many of these SIs are establishing “HANA Centers of Expertise” and “HANA practices”, putting directors in place, making press announcements, but do not have projects… Here at the SAPPHIRE I met two of these “directors” already, who approached me asking how HANA implementation projects look like and what works and what not. My first advise for them was: re-think what you want to do, analyse the broadening spectrum of HANA applications, and then try to focus. The thing is that SAP HANA world is huge and expanding and you cannot be in all places at all times. Especially if you are a small SI or a boutique firm. 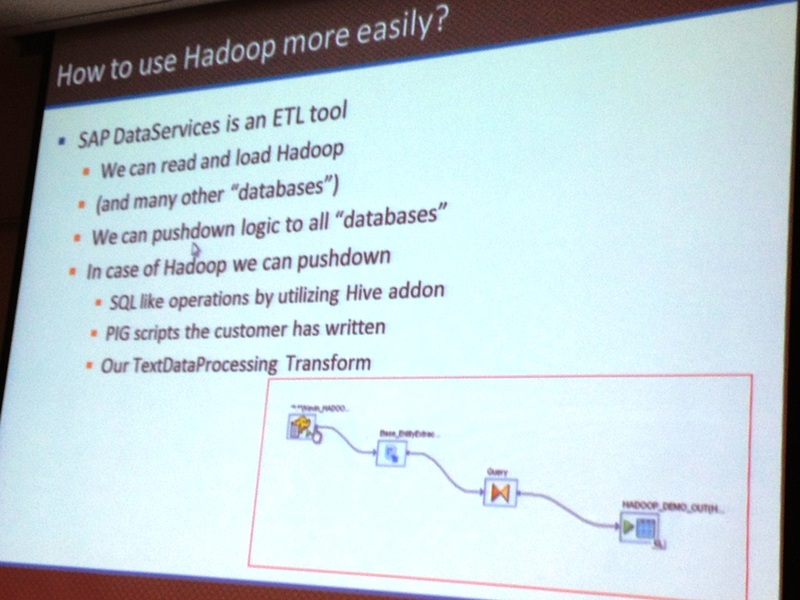 My second advise was: SAP HANA itself is just an element of the broader SAP’s database portfolio. If you want to focus on the SAP database business, you need to make sure that besides HANA you can speak Sybase as well. If you want to focus on the SAP business applications powered by HANA (like Rapid Deployment Solutions – RDS), you need to speak the broad portfolio of SAP applications in the LoB or Industry area, which may not be powered by HANA today. If you want to focus on analytics, you need to speak broad portfolio of SAP BusinessObjects – BI and EIM – as well, and know how to build solution in SBO, which runs on HANA database, but as well on MS SQL Server, Sybase IQ, HP Vertica etc. Going back to those who want to focus on the HANA as the database business with SAP, it is important that you separate hype from reality and understand the April 10th announcement of “SAP Real-Time Data Platform”.